Our lunch heralded the commencement of Spring with beautiful spring flowers adorning each of the tables. The Royal Oak at Balmain has hosted this luncheon for the past 14 years through the generosity of our treasurer Mrs Maureen Thornett. Our President Mrs Dorothy Ryan welcomed our guests and introduced Jacinta Tynan who once again carried out the duties of MC beautifully. Dorothy also welcomed our Guest Speaker Robyn Laughton-Smith – Domestic Violence Coordinator at the Royal North Shore Hospital who spoke to us of their roles in the prevention and treatment of child abuse. Ryan Clifton, our auctioneer has also worked with Cornucopia for many, many years and we had pleasure in presenting him with a plaque to acknowledge and thank him for his continual support. 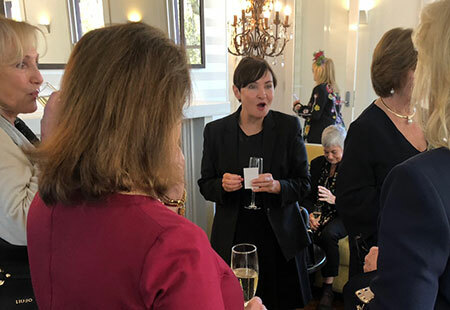 Our auction included a luxury 4 hour sail on Sydney Harbour, dining packages and a Patchwork Quilt donated by our Patron Mrs Linda Hurley, Wife of the Governor of NSW. 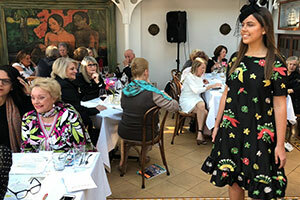 The Royal Oak lunch was again spectacular and we were treated to a glamorous fashion parade by Strelitzia, Balmain featuring Trelise Cooper fashion and Neil Grigg’s exotic millinery. Our thanks once again to De Bortoli Wines and our many generous sponsors without whom our fundraising would not be possible.